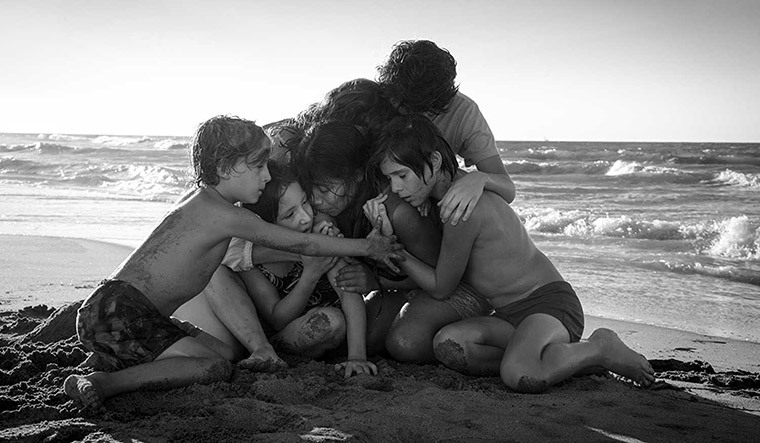 Mexican director Alfonso Cuarón’s latest flick Roma is an unusual film defying the common genres. The film is already a frontrunner among Oscar contenders for the best picture. It has a documentary-style narrative, sans drama or suspense. But it showcases powerful emotions and poignant moments, subtly. Roma is the story of Cleo (Yalitza Aparicio), a live-in maid from the Mexican indigenous community Mixtec, serving a wealthy white family. She toils from early morning till late night, preparing food, cleaning floors, washing dishes and looking after the four kids in the house. During her day off, she goes out with her boyfriend. But, he runs away when she becomes pregnant. Her child dies in labour, but she remains stoic and fatalistic. Sofia, the lady of the house where Cleo works, also undergoes a similar suffering, caused by her unfaithful husband. She confesses to Cleo, “No matter what they tell you, we women are always alone.” The story is set in the upscale neighbourhood of Colonia Roma in Mexico City in the 1970s—a period that witnessed violent student protests in Mexico. Cuarón is the first Mexican and Latin American to have won the Academy Award for Best Director (for the sci-fi thriller Gravity in 2013). And, Roma is his masterpiece. The film is based on his own childhood memories, and is made as a tribute to Libo Rodriguez, who used to work in his house. The movie has a black-and-white colour tone, and the dialogues are mainly in Spanish. Aparicio is the first indigenous heroine of a hit film in Mexican cinema history. She is also the first indigenous woman to appear on the cover of Vogue Mexico. Although indigenous Mexicans comprise twenty per cent of the population, they are marginalised from public life and politics, and many live in poverty. This is true for most of the forty million indigenous people in Latin America. Cuarón’s bold art film, celebrating the indigenous community, has found its match in the spirit of the new leftist Mexican president Andrés Manual López Obrador. Obrador has promised the emancipation of indigenous people, and had the film screened for the public, for free, in the presidential palace on December 13.